Everyone needs a boost up occasionally, but when you are three or four feet tall, a step stool is necessity. Give your children those added inches with free child step stool plans. 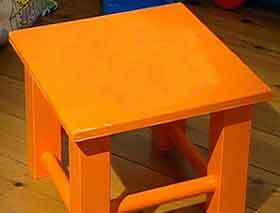 Build a safe and durable stool that uses common tools and stock lumber or plywood. 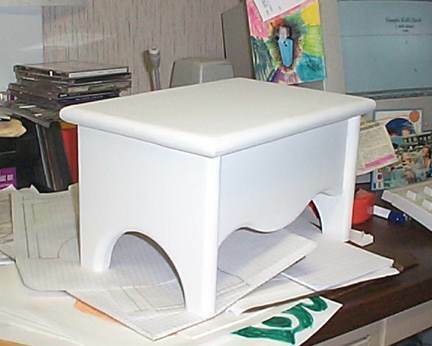 Free child step stool plans can be customized to a variety of heights and widths. Scrap lumber or plywood leftovers from other projects will work fine for this small step and it is a great beginning woodworking project. Make sure to round all edges and sand the surfaces before applying finish or paint. Animal shaped steps will require a jigsaw to cut the pieces, but square and rectangular wood can be cut with a power or hand saw. Choose non-toxic paints and finishes to complete your project and watch your little ones smile with delight when they try out their new step stool. A fun small project plan that will make up quickly - wooden kids stool. Plans for building a child's step stool. Make this simple step stool of 3' of 1 by 10 pine.